Home / Del. Co. Hist. Society / DCHS History / What was the Society doing 10 years ago (2007)? What was the Society doing 10 years ago (2007)? In November, 2017, the Delaware County Historical Society celebrates its 70th anniversary. The Society is dedicated to providing educational programs and services to the public, thanks to the support of our members, donors, and the Delaware County Commissioners. Part of this celebration is to review The Society’s own history. This article reviews what the society was doing 10 years ago, in the year 2007. 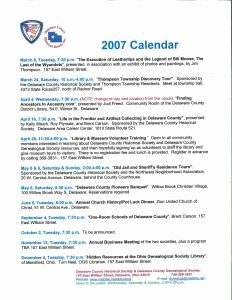 In 2007, we jointly planned our calendar of programs for the public with the Delaware County Genealogical Society. The two societies shared a single headquarters, at that time, and jointly managed the Library. They also jointly conducted the annual training for library and museum volunteers on Saturday, April 28. The historical society hosted a Native American exhibit of Jim Thompson’s photographs and paintings, featuring Leatherlips and Bill Moose. Mr. Thompson spoke at the Library on March 6 about the Wyandot Native American leader chief Leatherlips and about Bill Moose. Chief Leatherlips refused to join Shawnee Chief Tecumseh’s confederacy against the United States. Bill Moose (1837-1937), was known as the Last of the Wyandot Indians in Columbus. Brent Carson, Roy Plymale, and Kelly Misich gave a presentation about frontier life and displayed artifacts, including arrowheads, at the Delaware Area Career Center on April 17. On September 4, Brent Carson gave a presentation on “One-Room Schools of Delaware County”. Tours of the Old Jail and Sheriff’s Residence were given on May 5 and 6. Free tours for the public were first given in 2006, jointly sponsored by the Society and the Northwest Neighborhood Association (NNA), following a county government study, issued in 2005, on the preservation and possible re-uses of the historic building. The Sheriff’s Residence and Old Jail was built in 1878 and is on the National Register of Historic Places. An elegant residence for the county sheriff, combined with an attached jail, reflected the expanding role of the sheriff and an emphasis on proper, humane jail facilities, a concept popular at the time. Prison reform was one of Governor Rutherford B. Hayes’ top priorities. The Ohio Prison Plan of 1868 provided for the construction of state penitentiaries as well as new county jails. The Society sponsored tours of the Old Jail 2006-2012. Some of our members, who live in the northwest district, continue to share this remarkable cell-block tour with visitors as part of the NNA’s Ghost Walk in October. The Society’s Annual Meeting, including election of officers and trustees, was held at our Library on November 13. 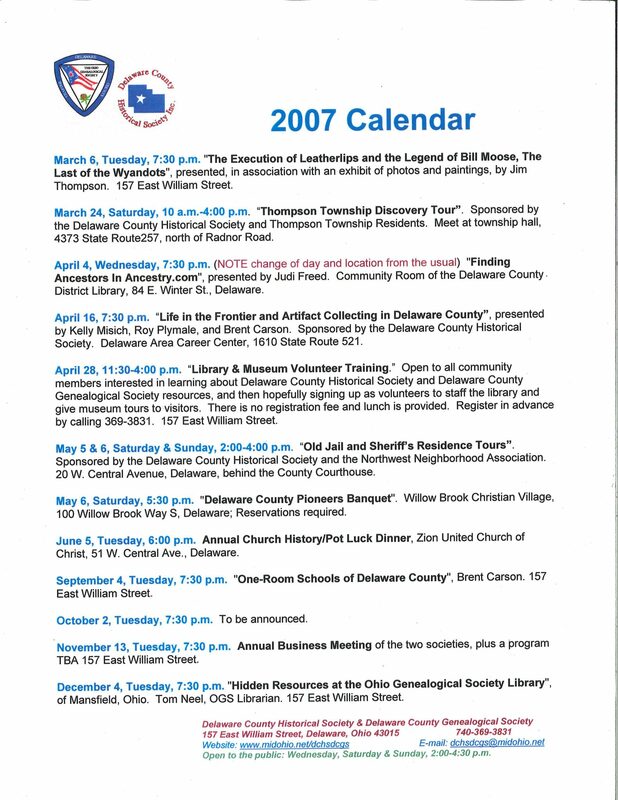 The fall issue of the Delaware County Historian shows Brent Carson was scheduled to speak about upcoming events during the 2008 Delaware City and County bicentennial. We hope you enjoyed this article and will want to view / read more. As part of our 70th Anniversary celebration, we have added About – Our History. There you will find images, videos and documents of activities and individuals from our rich past. Take a look at the 9-minute Video Summary of our History. You may also be interested in reading “Looking Back On Our First 70 Years” in the Delaware County Historian, Spring 2017.